On Saturday, January 19, 2013 Democracy Inspiring Voter Awareness (D.I.V.A.) will be presenting its MLK Awards with a special tribute to Dr. Martin Luther King, Jr.
Huntington, New York – On Saturday, January 19, 2013 Democracy Inspiring Voter Awareness (D.I.V.A.) will be presenting its MLK Awards with a special tribute to Dr. Martin Luther King, Jr. 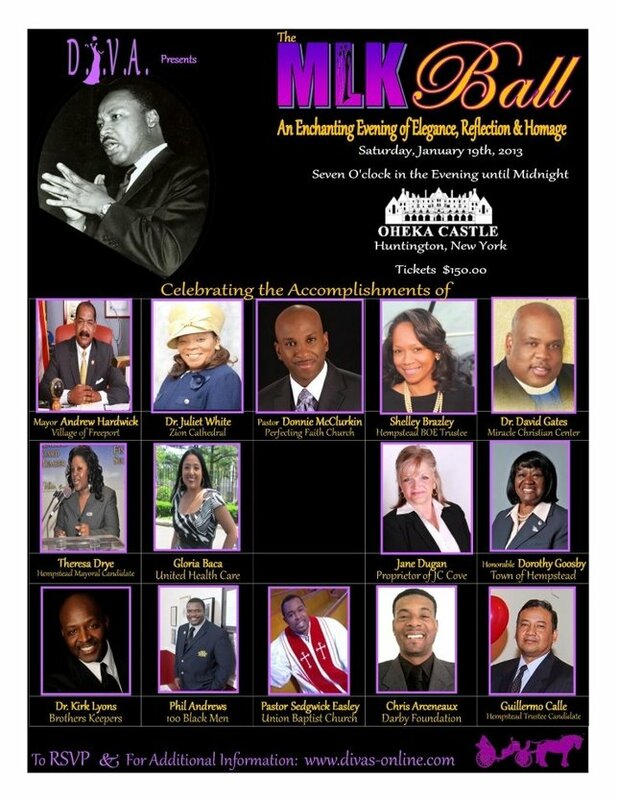 The MLK Awards will be held at the Oheka Castle located at 135 West Gate Drive, Huntington, New York 11743. The honorees for the evening are Mayor Andrew Hardwick, Village of Freeport, Pastor Donnie McClurkin. Perfecting Faith Church, Dr. Juliet White, Zion Cathedral, Shelley Brazley, Hempstead School Board Trustee Dr. David Gates, Miracle Christian Center, Theresa Drye, Mayoral Candidate for Inc. Village of Hempstead, Gloria Baca, Outreach & Marketing Specialist, United Health Care Community Plan, Jane Dugan, Owner/Proprietor of JC Cove, Councilwoman Dorothy Goosby, Town of Hempstead, Dr. Kirk Lyons, Brothers Keeper, Phil Andrews, President of 100 Black Men of Long Island, Inc., Pastor Sedgwick Easley, Union Baptist Church, Chris Arceneaux, President/CEO of The Darby Foundation, and, Guillermo Calle, Trustee Candidate for Inc. Village of Hempstead. $35 - Friends of D.I.V.A. Please submit all ads by Friday, January 4, 2013. The Minstrel Players Present Ken Ludwig's "Lend Me a Tenor"
Subject: LongIsland.com - Your Name sent you Article details of "Democracy Inspiring Voter Awareness to Present MLK Awards at Oheka Castle"